Could the Pink Blanket Help to Re-open the case? Moderator of this forum, HiDeHo, posted this on MM forum but might be good here too. The 'missing' pink blanket has often been referred to as a myth. Apparently it is not only true, but, according to Paulo Sargento (maybe talking on behalf of Goncalo Amaral) it may be important enough to re-open the case! Has anyone read 'A Mordaça Inglesa' - The English Gag? Goncalo Amaral apparently refers to the pink blanket in the book. Is it possible for a quote on that portion? A source close to the McCanns said: "They just despair. This is the level of distortion and lies they've been up against." The source refuted any suggestion that a blanket had disappeared. He said: "You could see it on the bed in the first photographs taken of the room. Amaral wasn't even there." We have been informed that psychologist Paulo Sargento, a regular commentator of the Maddie case on television, has sent the Republic's Attorney General a letter with information that may reopen the "Maddie case" process. Although he declined to reveal the contents of this letter, he advanced that there is something "very important" concerning the cuddle cat (Maddie's soft toy, that Kate often carried with her during her media appearances), an object which, as has been made public, was positively signalled with cadaver odour by the sniffer dogs. 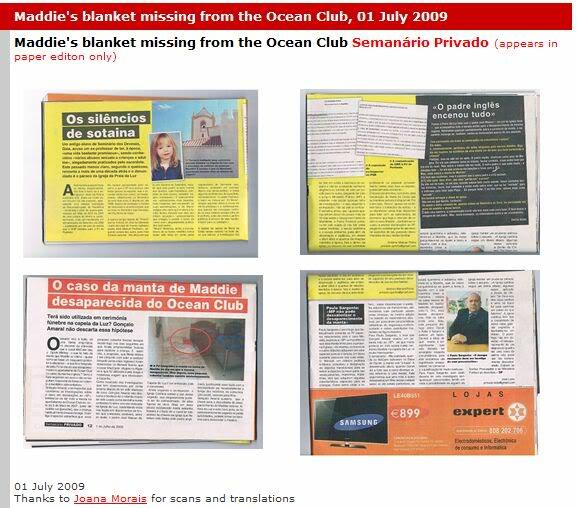 Together with "Maddie's blanket", the pink soft toy may be a starting point to reopen the process "at a time when, apart from an attempt to silence Gonçalo Amaral, through an injunction against his book 'The Truth about the Lie', a shameful picture of an attack on the family of the former inspector, by the British media, is starting to emerge," the psychologist told Semanário Privado. Could it have been used in a funerary ceremony at the Luz chapel? Gonçalo Amaral doesn't dismiss that as possibility. The issue was brought to light, in an enigmatic approach, during the interview given by the McCann couple to Oprah Winfrey. What had happened to the blanket that Maddie used to be covered with – almost as if it was a protective and comforting safeguard – and that was photographed by the PJ, in the day of her disappearance from the Ocean Club apartment, on the bed of the English girl? Gerry and Kate gulped in silence and were unable to answer in a consistent manner to the mediatic TV show host. Gonçalo Amaral, the former inspector who coordinated the investigations on the case, in declarations to the «SP» recalls to have seen the blanket in the Ocean Club apartment, on the evening of the 3rd of May, close to cuddle cat (the plush toy), that the child usually carried with her. 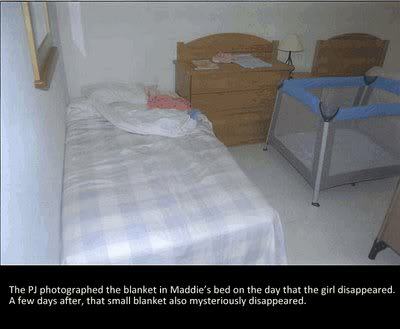 The former inspector thought that it was odd that that blanket went missing in the immediate days that followed, when searches where made to locate the child. And he highlights, that incidentally, textile fibres (in connection with the cadaver odour scented by the British dogs) were detected in the Renault Scenic that the McCann Couple rented in the Algarve and which was used in a long and mysterious trip that they made to Spain. We went to Praia da Luz to speak with Father José Manuel – the priest of the local church – who accompanied all the sequence of events, lived after the disappearance of the English girl. Refuting all knowledge regarding the whereabouts of the blanket, the Father also denies the insinuations against his past. I participated, but I don’t know anything. The British priest, called by Madeleine parents, it was him who celebrated all the masses. In that context, the only thing that I could do for her was to pray. 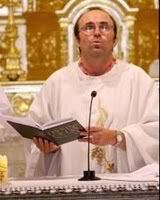 The other priest is the one who knows a lot – and he staged everything – it was him who made statements and who spoke to the PJ. But, where could Maddie’s blanket be? -It would be good to know, it’s possible that the other priest and the PJ know. I don’t know anything; I only know that, when everything was too ‘hot’, various stories were told, badly told and even more about me: that I was ‘exiled’ to the Vatican to speak with the Pope… Just because I missed 2 or three days, I was made an ‘exiled’. It’s all a lie; the media have nothing else to do. It is easy to attack the image of a priest. But, at this moment the defamers are being sued. Re: Could the Pink Blanket Help to Re-open the case? What if inside the McCann's hire car (in August), forensics found traces of some kind of pink fibre. Perhaps the pink fibres had body fluids on it. Upon closer examination of these fibres, perhaps it was shown to contain wool and was likely to have come from a blanket? The PJ then searched all of their photo's taken on the night and they discovered that it could be a perfect match to Madeleine's pink blanket as seen on her bed. So the PJ approached the McCann's in August 2007 and asked to see the pink blanket to compare the fibres, but the McCann's claimed they no longer had the blanket? were detected in the Renault Scenic that the McCann couple rented in the Algarve and which was used in a long and mysterious trip that they made to Spain. Goncalo must have asked the McCann’s to produce the blanket to check to see if the fibres matched with what they had found? This must be why it is so important, because they can no longer have it?